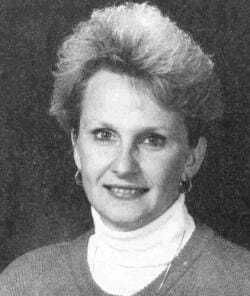 Debbie (Lawrence) Azotea participated in three sports (volleyball, basketball and softball) while a student at Quincy Notre Dame from 1975-1979. Debbie earned twelve (12) varsity letters, established many season and career records in all three sports, many of which are still unbroken. Debbie was a varsity starter in all three sports for all four years. Debbie was voted as most valuable player by her teammates three of the four years. She did not win the award in 1978 because the whole team was voted MVP after winning the first state championship in the school’s history. Debbie was chosen as a member of the all-state tournament team in both 1977 and 1978. In her career at Quincy Notre Dame, Debbie played in 83 matches and scored 579 service points. She completed 777 successful serves out of 886 attempts, and her service reception percentage was 72%. For four years Debbie was a member of The Quincy Herald-Whig All-Area team. She was voted most valuable player by her teammates for four straight years. She was honorable mention All-State during both her junior and senior years and tried out for the Junior Olympic team as a sophomore. She led the Raiders in both scoring and rebounding for four years. Her scoring average for four years was 20, 22, 24, and 28 points, respectively. Debbie played shortstop, third base, center field and pitched during her QND softball career. Two of her four years she was voted MVP. She had career records for most extra-base hits, triples, homers and RBIs. These have only been surpassed in recent years with expanded schedules and then by the likes of Caren Kemner. Debbie’s career batting average was .333.